We get it. As a business owner, you want to maximize your bottom line and avoid unnecessary costs. You may have even heard that workers’ compensation insurance isn’t necessary in your line of work, with your number of employees or even in your state. We can tell you that as a licensed agent with 15+ years of experience in handling workers’ compensation claims, there are a lot of myths and inaccurate information out there regarding this important insurance. Simply not knowing the facts has cost many businesses tens and hundreds of thousands of dollars! Fact is, costly lawsuits, fines and even jail time could be the results of ignoring this critical insurance in your business. We would hate for you to put your business and hard-earned money at risk simply because you don’t know the truth. So, below are 4 truths that will shed light on this important insurance for your business. We live in a litigious society. People sue their neighbors, their friends, even their family. So, do you believe they’ll think twice about suing their employer or former employer? Of course not. This critical insurance typically contains a provision that protects businesses from civil lawsuits over employee injuries, accidents and illnesses. Without that coverage, you might just find yourself on the receiving end of a lawsuit from an injured employee. We’ve seen first hand how seemingly minor injuries have cost business owners $10,000, $50,000, even $100,000 or more. Some businesses even had to close their doors as a result. The good news is that for most lines of work, workers’ compensation insurance is very affordable. And that small investment can save you from being dragged into a courtroom, racking up crazy high attorney fees and ultimately paying tens of thousands in a lawsuit. While you may think that this type of insurance coverage is optional, that may not be the case. In most U.S. states, there are laws requiring businesses hold these insurance policies to eliminate the need for litigation. 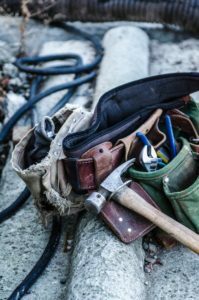 So, even if you have a small business with just a few people, even if your business is not prone to accidents and injuries, you may still be required to carry workers’ comp coverage. If you don’t have this insurance, you might be subject to heavy fines. Or worse, jail time. Now, we don’t mean to scare you. However, to protect yourself and your business, you really need to have this conversation either with our team or another licensed insurance agent that is proficient in workers’ compensation. If an insurance agent gives you a black and white answer about workers’ compensation insurance, you should question that agent since the laws in each state are different and the specifics about your business could create dozens of different answers. Most every state in the U.S. does require businesses to carry this insurance once they hire a certain number of employees. But here’s the tricky part: The number of employees threshold varies by state. In some states, you must offer coverage with your first employee. In other states, it’s not until you have five employees. In addition, not only are the laws blurred by state, so are the fines. Let’s talk. After just a couple of minutes of learning about your business and where you operate, we can provide a much clearer picture of the amount of coverage you need to protect your assets and business. The first time you speak with us, you’ll notice a refreshing difference. We EDUCATE but never sell. We LISTEN to your goals and needs. Only then do we offer a solution. Our goal is to inform you about the RIGHT amount of insurance coverage you need to best protect your assets, your business, and your family. No more, no less. We’ll be the ones to happily inform you when you don’t need specific coverage. Yet, when it’s absolutely essential to avoid financial risks or financial ruin, you can bet we will recommend it. Finally, rather than a “one policy fits all” solution, we know that your business and your needs are unique to you. That’s why we will never give you a blind, online quote. We always start with a conversation with you. Let’s have that conversation. Call us at 615-987-0067 or contact us so we can ensure your business is properly covered. Then, we will work with you to find the coverage that’s right for you at the lowest possible price.